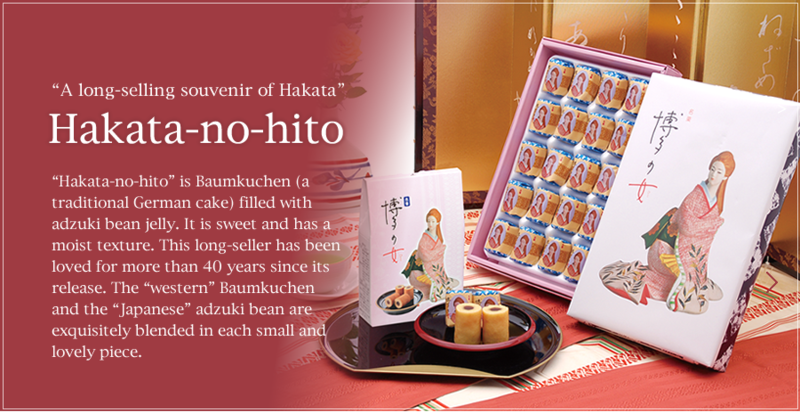 "A long-selling souvenir of Hakata"
"Hakata-no-hito" is Baumkuchen (a traditional German cake) filled with adzuki bean jelly. It is sweet and has a moist texture. 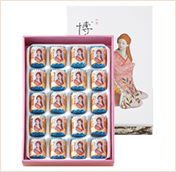 This long-seller has been loved for more than 40 years since its release. 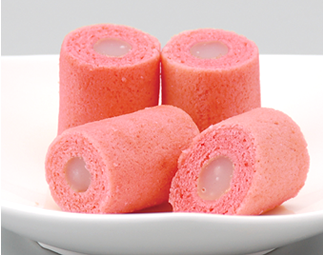 The "western" Baumkuchen and the "Japanese" adzuki bean are exquisitely blended in each small and lovely piece. 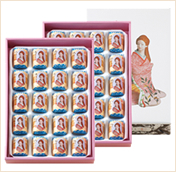 Baumkuchen is highly appreciated as a food that is associated with an image of prosperity or longevity and as a gift for auspicious occasions, due to its appearance like layered tree rings. 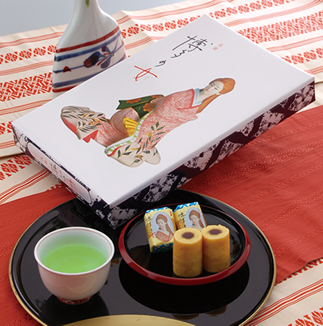 So "Hakata-no-hito" is the best choice for a travel souvenir. Furthermore, "Hakata-no-hito" is highly evaluated internationally. 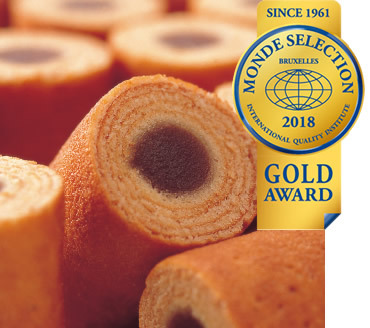 It was awarded a Monde Selection gold prize, which can only be received by products that meet high technological standards, including taste testing, sanitation management, etc. "Hakata" means an area that has prospered as a center of culture and business in Fukuoka Prefecture since ancient times. It is deeply entrenched in the hearts of local people as the "heart and soul of Fukuoka people". 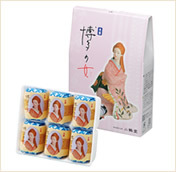 The woman doll on the package is a traditional handiwork made in Fukuoka Prefecture. 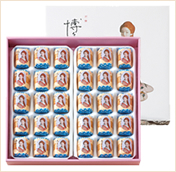 Hakata dolls have a long history. They began to be made around 1600. They are made of earth. Painting is added on unglazed dolls one by one. Only craftsman can make those dolls. It was sent to the 1900 Paris Exposition and became famous even abroad. 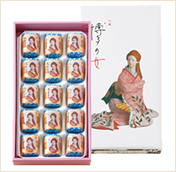 A Hakata doll is printed on the package because we would like you to easily take a "Hakata doll" that Fukuoka Prefecture boasts to the world. 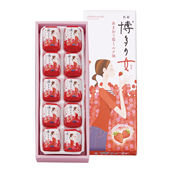 "Moist texture and gentle sweetness with a soft flavor of strawberry"
This is an aromatic flavorful confectionery in which white-bean-paste based milk jelly is wrapped in sweet-and-sour Baumkuchen dough in which Amaou strawberries are kneaded. Condensed milk and whip cream are lavishly used for milk jelly. 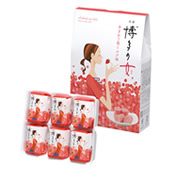 Enjoy the harmony of Amaou strawberries and milk that spread in the mouth. 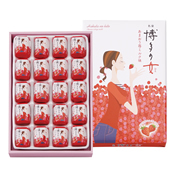 “Hakata Amaou” is the high-grade strawberry of which Fukuoka Prefecture is proud. Its large berry is listed in the Guinness World Records because it is the heaviest strawberry in the world. 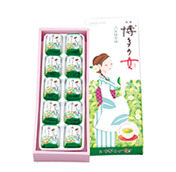 A Japanese confectionery in which powdered green tea is mixed with soy bean jelly. 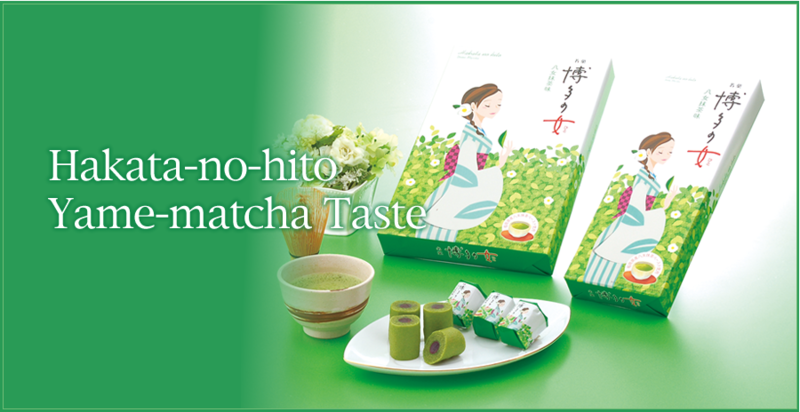 "Yame City, Fukuoka Prefecture" is one of the leading sources of matcha (powdered green tea). 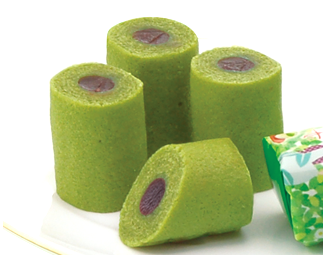 Paste of Yame matcha is kneaded into adzuki bean jelly which is carefully wrapped with multi-layered Baumkuchen. It is then divided into pieces so that you can eat the piece in one bite. 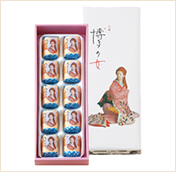 It is a confectionery that makes you feel the Japanese spirit of harmony through the flavors of matcha and adzuki beans.